Here’s a common problem: You want to power your gizmo that runs on D cells, but all that you have handy are C cells. In many (but not all) circumstances, you can solve this problem by using the C cell and making up the battery length difference with a few quarters– typically three or four. There is a 12 mm length difference between a C cell and a D cell, and quarters are about 2 mm thick, so if your gizmo has a really weak spring it could take up to six quarters to do the job. Yes, commercial battery size adapters are available. They typically cost between 1.5 and three dollars and can only be used for the one purpose– adapting battery sizes. (Well, that, and as a set of matryoshki.) Using quarters can also potentially end up costing as much as $1.50, but it can go straight back into your wallet when you’re finished! Much more importantly, when you really need it, you can probably find a few quarters no further away than your pocket. This entry was posted in EMSL Projects and tagged cheap, diy, money. Bookmark the Permalink. Very nice idea, I’m going to try that if I ever run out of D cells. But the picture looks like a big fat short circuit to me – are you sure the batteries are not to be connected in parallel? Oops – that’s the problem with taking things apart and putting them back together for the sole purpose of taking pictures. I should’ve been paying closer attention! Good catch. Or maybe it’s a parallel connection with one of the batteries in the wrong way round ! Check out the spring tabs are both at the same end. Hmm. It IS a "big fat short circuit". Look at the metal connector parts. 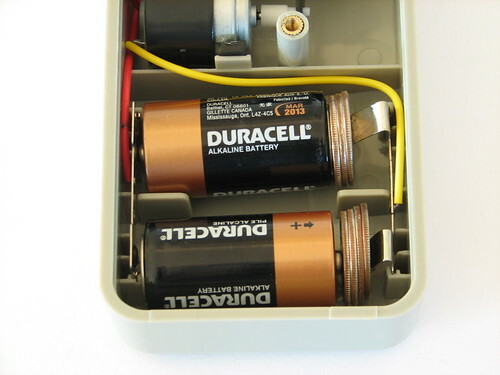 This battery compartment was originally designed to hold two D cells in parallel, not the typical reversed series layout. If you can’t see the buss plates, look at the spring tabs (that’s a clue — they’re both on the same side). Not do detract from the basic idea, which was a clever one, but I’d bet this this particular prototype got pretty hot pretty quick! As we noted earlier– we seriously goofed when we took it apart and put it back together to photograph. (Doh!) Since we didn’t have this thing turned on when we were taking photos we didn’t notice that anything had gone wrong. And, as you note, it just doesn’t make a good connection when it’s backwards. I believe this would better be described as the $1.50 C-to-D adapter? For most D-size battery holders, putting in 3 or 4 quarters seems to be enough to make the C cell fit well. Above, you can see that we’ve used a total of seven quarters– three on one cell, four on the other. So, it’s usually a $0.75 or $1.00 adapter. So… A lot of people have look at this and remark that it’s really a $1.75 adapter. And no, it’s not. That’s two adapters for two battery cells that are adapted. And– no surprise here– if we had adapted something that took more D-cells, it would cost more yet. I did something similar last month; I replaced the bulbs in my fridge with fluorescent ones, but the fluorescent ones had big badonkadonks (where the ballast lives) at the base of the bulb so they wouldn’t screw into the sockets. Eight pennies wrapped in electrical tape later, there was light. I normally just stretch the spring out to make it longer. I’ve also done this in the case where something needs AAs and all I have are AAAs. They hold the same charge, 1.5v, and a AAA isn’t much smaller than a AA. Now, with the C to D, the only thing I really did this with was cheap flashlights. You know those colored plastic ones? They have a coil spring on the end, and stretching that maybe half an inch will work to replace the 3 D batteries with 3 C ones. Don’t shake it around too much, though as the C cell batteries are a bit loose in the flashlight. But hey. It works in a pinch. Looks like a $1.75 adapter… call me picky… but why not just use some pennies and make it a nice .13 cent adapter? Ching! I use to always use aluminum foil. ( it’s a good conductor) Less movement. I tried this, but I couldn’t find 4 quarters, so I tried 2 quarters a dime, 3 nickels, and 25 pennies. I am having trouble getting the whole dollars worth together, much less getting the batteries in. Any suggestions? I’m glad this isn’t for jumpstarting a pacemaker or something. I would be dead by now. you need quarters dumbass, where did you go to school Texas? I think you missed the joke, dumbass. I have an invention related to this!! Great idea using quarters except do not do this in a metal barreled flashlight. If the quarters come in contact with the side of the flashlight you will have a dead short and kill the batteries. i tried this experiment and while doing this, my battery melted. is there a certain type of battery that should be used? or a certain electronic?